Rajaniemi, Hannu. 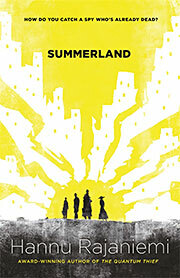 Summerland . Gollancz 2018. Summary: Set during an alternative Spanish Civil War of a world in which the "armies of afterlife" have arisen. Published: Gollancz 2018 (1473203279BUY, 1473203287BUY).